This article is about the first game in the Rainbow Six video game series. For the series, see Tom Clancy's Rainbow Six. For the novel with the same name, see Rainbow Six (novel). Tom Clancy's Rainbow Six is a tactical shooter video game and the first in the Rainbow Six series. It was developed and published by Red Storm Entertainment in 1998 for the PC. It was ported to Mac OS, Nintendo 64, PlayStation, Dreamcast, and Game Boy Color. An expansion pack, Tom Clancy's Rainbow Six Mission Pack: Eagle Watch, was released on January 31, 1999. On October 29, 2018, Sony revealed that the PAL version of the game would be one of 20 games pre-loaded on the PlayStation Classic (excluding Japan, Taiwan and Hong Kong), which was released on December 3, 2018. Rainbow Six is a tactical shooter, which focuses more on stealth and tactics than on sheer firepower, exploring the lethality of a single bullet. To add to the realism, all in-game characters, terrorists, hostages and Rainbow operatives, can be wounded or dispatched in just fractions of a second with only one or two bullets. Tools such as thicker body armor, automatic rifles, and grenades have little value before the player grows accustomed to the gameplay. Before each mission is a planning stage, during which the player is given a briefing, and then chooses the operatives to be involved in the mission, their weapons, equipment and uniform/camouflage. During this step, the player pre-established orders and waypoints. The planning stage determined elements such as the path the AI-controlled squads would follow during the mission, as well as where they will deploy devices such as flashbangs or door breaching charges. Successful missions often last just minutes, but may require dozens of repetitions and planning changes (many more for beginners). During gameplay, the player controls only one team member directly, and can see stats for that member and all units on the heads-up display. Teams not under player control follow the orders given to them in the planning stage. The player can take control of any living operative at will, making them the leader. The game forms a campaign that is a series of scenarios, with the plot being advanced in the mission briefing of each scenario. Any casualties that occur during a mission are permanent, so the deceased cannot be used in future missions. Consequently, many players replay missions that are technically successful merely to reduce the number of casualties. Online multiplayer gaming was popular on the Mplayer.com and Zone.com services and for a time featured a thriving competitive clan based community with numerous independent ladder style leagues. Unlike the other versions, the PlayStation version actually showed the gun being held in the player's hands. Rainbow Six is set in the year 1999 and 2000. Rainbow is a newly created multinational counter-terrorism unit, composed of elite soldiers from NATO countries, Brazil, Austria, Sweden, Australia, Russia and Israel, formed to address the growing problem of international terrorism. The organization's director is John Clark, and the team leader is Ding Chavez. The term "Rainbow Six" refers to the director of the organization, John Clark. Soon after its inauguration, Rainbow finds itself responding to a series of seemingly unrelated terrorist attacks by the Phoenix Group, a radical eco-terrorist organization. Throughout its investigation, Rainbow is assisted and advised by John Brightling, chairman of the powerful biotechnology corporation Horizon Inc. However, Rainbow eventually learns that the Phoenix Group is actually a front for Horizon Inc itself. Brightling's company is developing a highly contagious strain of the Ebola virus called "Brahma", adapted from a strain killing Central African cattle (called "Ebola Shiva" in the novel) with the ability to kill every human being on the planet. In order to protect "mother nature", John Brightling is planning to kill most of the human race, sparing only Brightling's chosen few, who will re-emerge and rebuild the planet into a scientific and environmentally-friendly utopia. To achieve this goal, he has used the scattered terrorist attacks to create fear of terrorism, which he then exploited in order to get a security contract for his own private security firm at the Olympic Games. Brightling's plan is for his "security personnel" to unleash the virus at the games, spreading it to all the countries of the world. Rainbow succeeds in preventing the release of the virus at the Olympics, but Brightling and his collaborators retreat to their Horizon Ark facility in the Brazilian jungle, from which they had originally planned to weather out the global holocaust. Rainbow infiltrates the facility, killing all of Brightling's collaborators and capturing Brightling himself. Red Storm Entertainment (founded by author Tom Clancy) had originally planned to do a special operations game featuring first-person action, and a team of operators rescuing hostages and taking out terrorists. Their first concept was modeled after the FBI Hostage Rescue Team. Later they decided to make the concept more international, as HRT would only operate in the United States, and renamed it "Black Ops" and incorporated operators from all over the world. It was then they found that Clancy was writing a book about terrorism and a special team to combat it, so they rewrote some of the missions to fit within the book plot and Clancy shared his research with the game development team. The book was Rainbow Six so the game was renamed Rainbow Six. However, by the time they finished the game, the book was not yet finished. Thus, the plot of the game does not completely match the plot of the book. Tom Clancy's Rainbow Six Mission Pack: Eagle Watch was released on January 31, 1999 as an expansion pack to the original game. It adds five new missions, four new operatives, three new weapons and new multiplayer modes. The new missions take place in the year 2001 and are a series of scenarios unrelated to each other or the original game. The expansion was packaged with the original game as Tom Clancy's Rainbow Six Gold Pack Edition in 1999. In the United States, Rainbow Six's Windows release sold 218,183 copies during 1998. These sales accounted for $8.86 million in revenue that year. The computer version's Gold Edition release sold another 321,340 copies in the United States during 1999, and was the country's 12th best-selling computer game that year. 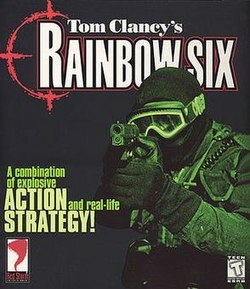 According to Gamasutra, Rainbow Six and Tom Clancy's Rainbow Six: Rogue Spear together sold 450,000 copies "during the first half of the 2001/2002 fiscal year". Rainbow Six was met with mostly positive reviews on PC. However, the console versions received average to negative response upon release. GameRankings gave it a score of 81.81% for the PC version; 73.71% for the Nintendo 64 version; 72.28% for the Dreamcast version; 53.83% for the Game Boy Color version; and 48.07% for the PlayStation version. Metacritic gave only the PC version a score of 85 out of 100. GameSpot described the PC version as "actually a pretty good game, albeit very hard and extremely frustrating", and its "audio cues, background sounds, and other various noises are also represented very well; the immersive feeling of Rainbow Six is perhaps one of the best seen in a game." In 1998, CNN working in partnership with Games.Net named Tom Clancy's Rainbow Six as one of the "Top 25 game downloads of 1998". The Academy of Interactive Arts & Sciences nominated Rainbow Six for its 1998 "Action Game of the Year" award, although the game lost to Half-Life. Rainbow Six was a finalist for Computer Gaming World's 1998 "Best Action" award, which ultimately went to Battlezone. The editors wrote that Rainbow Six "deftly mixed strategic planning with nail-biting action as it brought the world of counterterrorist operations to life." PC Gamer US named Rainbow Six the best action game of 1998. ^ "Announcing PlayStation Classic's Full Lineup of 20 Games". PlayStation.Blog. ^ Glagowski, Peter (November 26, 2018). "Nine games on the PlayStation Classic will be PAL versions". Destructoid. Retrieved November 26, 2018. ^ "Postmortem: Redstorm's Rainbow Six". Gamasutra. January 21, 2000. Archived from the original on 4 August 2001. Retrieved August 6, 2007. ^ a b "Tom Clancy's Rainbow Six for PC". GameRankings. Archived from the original on July 27, 2014. Retrieved July 23, 2014. ^ a b "Tom Clancy's Rainbow Six for Nintendo 64". GameRankings. Archived from the original on July 27, 2014. Retrieved July 23, 2014. ^ a b "Tom Clancy's Rainbow Six for Dreamcast". GameRankings. Archived from the original on July 27, 2014. Retrieved July 23, 2014. ^ a b "Tom Clancy's Rainbow Six for Game Boy Color". GameRankings. Archived from the original on July 27, 2014. Retrieved July 23, 2014. ^ a b "Tom Clancy's Rainbow Six for PlayStation". GameRankings. Archived from the original on July 27, 2014. Retrieved July 23, 2014. ^ a b "Tom Clancy's Rainbow Six for PC Reviews". Metacritic. Archived from the original on March 2, 2015. Retrieved July 23, 2014. ^ Suciu, Peter. "Tom Clancy's Rainbow Six (PC) – Review". AllGame. Archived from the original on November 14, 2014. Retrieved July 23, 2014. ^ Simpson, Chris. "Tom Clancy's Rainbow Six (DC) – Review". AllGame. Archived from the original on November 14, 2014. Retrieved July 23, 2014. ^ Ottoson, Joe. "Tom Clancy's Rainbow Six (Mac) – Review". AllGame. Archived from the original on November 14, 2014. Retrieved July 23, 2014. ^ Scoleri III, Joseph. "Tom Clancy's Rainbow Six (N64) – Review". AllGame. Archived from the original on November 14, 2014. Retrieved July 23, 2014. ^ Kanarick, Mark. "Tom Clancy's Rainbow Six (PS) – Review". AllGame. Archived from the original on November 14, 2014. Retrieved July 23, 2014. ^ Huey, Christian. "Tom Clancy's Rainbow Six (GBC) – Review". AllGame. Archived from the original on November 14, 2014. Retrieved July 23, 2014. ^ "Tom Clancy's Rainbow Six (N64)". Electronic Gaming Monthly. 1999. ^ "Tom Clancy's Rainbow Six (DC)". Electronic Gaming Monthly. 2000. ^ "Tom Clancy's Rainbow Six (PS)". Electronic Gaming Monthly. 1999. ^ McNamara, Andy (February 29, 2000). "Rainbow Six – Nintendo 64". Game Informer. Archived from the original on November 19, 2000. Retrieved July 23, 2014. ^ McNamara, Andy (February 29, 2000). "Rainbow Six – PlayStation". Game Informer. Archived from the original on December 7, 2000. Retrieved July 23, 2014. ^ Olafson, Peter (1998). "Tom Clancy's Rainbow Six Review for PC on GamePro.com". GamePro. Archived from the original on February 19, 2005. Retrieved July 23, 2014. ^ The Freshman (1999). "Rainbow 6 Review for N64 on GamePro.com". GamePro. Archived from the original on February 11, 2005. Retrieved July 23, 2014. ^ The D-Pad Destroyer (December 8, 1999). "Rainbow 6 Review for PlayStation on GamePro.com". GamePro. Archived from the original on February 4, 2005. Retrieved July 23, 2014. ^ Johnny B. (September 1998). "Rainbow Six Review (PC)". Game Revolution. Archived from the original on July 28, 2014. Retrieved July 23, 2014. ^ Wolpaw, Erik (June 5, 2000). "Rainbow Six DC Review". GameSpot. Retrieved July 23, 2014. ^ a b Dunkin, Alan (September 9, 1998). "Tom Clancy's Rainbow Six Review (PC)". GameSpot. Archived from the original on November 17, 2014. Retrieved July 23, 2014. ^ Provo, Frank (May 1, 2000). "Rainbow Six Review (GBC)". GameSpot. Retrieved July 23, 2014. ^ Nutt, Christian (October 12, 1999). "Rainbow Six Review (N64)". GameSpot. Archived from the original on April 11, 2015. Retrieved July 23, 2014. ^ Nutt, Christian (October 8, 1999). "Rainbow Six Review (PS)". GameSpot. Retrieved July 23, 2014. ^ Subskin (April 22, 2000). "Rainbow Six". PlanetDreamcast. Archived from the original on January 31, 2009. Retrieved July 23, 2014. ^ Ward, Trent C. (September 8, 1998). "Rainbow Six (PC)". IGN. Archived from the original on October 12, 2014. Retrieved July 23, 2014. ^ Boulding, Aaron (November 24, 1999). "Rainbow Six (N64)". IGN. Archived from the original on January 15, 2015. Retrieved July 23, 2014. ^ Dunham, Jeremy (May 19, 2000). "Tom Clancy's Rainbow Six (DC)". IGN. Archived from the original on September 24, 2015. Retrieved July 23, 2014. ^ Harris, Craig (April 14, 2000). "Rainbow Six (GBC)". IGN. Archived from the original on May 26, 2015. Retrieved July 23, 2014. ^ White, Matt (January 3, 2000). "Rainbow Six (PS)". IGN. Archived from the original on January 8, 2014. Retrieved July 23, 2014. ^ "Rainbow Six (N64)". Nintendo Power. 127: 157. December 1999. ^ "Rainbow Six (GBC)". Nintendo Power. 130. March 2000. ^ "Tom Clancy's Rainbow Six". Official U.S. PlayStation Magazine. 1999. ^ Vaughn, Tom (October 1998). "Tom Clancy's Rainbow Six". PC Gamer: 198. Archived from the original on March 3, 2000. Retrieved July 23, 2014. ^ Bottorff, James (1998). "Interactive Clancy". The Cincinnati Enquirer. Archived from the original on October 1, 2007. Retrieved July 23, 2014. ^ a b Staff (April 1999). "The Numbers Game; Does Award Winner = Best Seller?". PC Gamer US. 6 (4): 50. ^ Staff (April 2000). "Shake Your Money-Maker". PC Gamer US. 7 (4): 32. ^ "Acquisitions Propel Ubi Soft Sales Up 72%". Gamasutra. November 5, 2001. Archived from the original on August 11, 2014. Retrieved July 2, 2012. Video games set in Washington, D.C. This page was last edited on 7 April 2019, at 20:16 (UTC).